Mouse anti Human MMP-9 SB15c. Product is tested for Frozen Sections, Enzyme Immunoassay, Paraffin Sections. Immunoblotting (Reported in literature, See also Ref.4). MMP9, also known as gelatinase B, is a secreted enzyme which degrades the interstitial collagens, types I, II, and III and is produced by normal alveolar macrophages and granulocytes. The expression of MMP9 increases in Epstein-Barr virus infected lymphoma derived cell lines and may be of significance in typically invasive nasopharyngeal carcinomas. 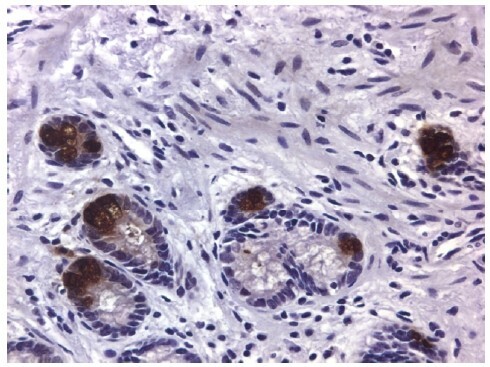 MMP9 is constitutively produced by some tumor cell lines (e.g. : HT1080, HL60, U937) but not by most quiescent cells and tissues. Treatment of cells with the phorbol ester TPA stimulates production of MMP9 in some cell types, but the low protein levels produced (pg/ml) often require concentration of cell culture media to visualize the bands by Western blotting. 1. Ye H, Yu T, Temam S, Ziober BL, Wang J, Schwartz JL, et al. Transcriptomic dissection of tongue squamous cell carcinoma. BMC Genomics. 2008;9:69. 2. Ouvrier A, Alves G, Damon-Soubeyrand C, Marceau G, Cadet R, Janny L, et al. Dietary cholesterol-induced post-testicular infertility. PLoS One. 2011;6(11):e26966. 3. Stenvold H, Donnem T, Andersen S, Al-Saad S, Al-Shibli K, Busund L, et al. Overexpression of matrix metalloproteinase-7 and -9 in NSCLC tumor and stromal cells: correlation with a favorable clinical outcome. Lung Cancer. 2012;75:235-41. 4.Liu G, Liu Y, Yang Z, Zhu A, Zhao C. MicroRNA-524-5p suppresses the growth and invasive abilities of gastric cancer cells. Oncol Lett. 2016;11:1926-32. 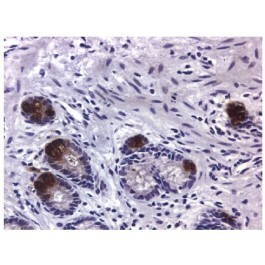 This antibody is specific for Human MMP-9. Does not cross react to Human MMP-1, MMP-2 or MMP-3.